They are courageous, tough as nails and extremely intelligent. Also protective of property and a devoted family dog. They have great strength and endurance and are one of the most “natural” breeds of domesticated dog, with very little incidence of the common hereditary problems.They make an ideal house-dog as they need very little bathing and with regular grooming don’t have the usual “doggy” smell that other breeds suffer from.They have the intelligence, agility and ‘nose’ to successfully train for any of the obedience, agility and trailing hobbies.They are the longest lived dog on record – “Bluey” died in 1939 at the ripe old age of 29 years and 5 months. He worked cattle and sheep for 20 years before he retired. If not exercised enough, both mentally and physically, then this spells TROUBLE!!! They have been bred to bite for generations so don’t be surprised if you receive the odd nip in moments of excitement (or when your children run).Very territorial and can tend to be unsociable towards strange dogs – doesn’t care if it’s three times its size!! Can be stubborn and intractable if handled/trained wrongly. They are not the ideal dog for the first time dog owners. Needs someone who has had previous experience and knowledge of dogs – and knows what they are letting themselves in for! They can live on the smell of an oily rag and will literally eat anything. Whatever quantity a dog food manufacturer recommends for this size of dog – half it!They make a great mate and companion and their only desire in life is to spend every minute of the day with their owner – do not make good outside dogs with no interaction. Not suited to a sedentary city life on a small section, or to being left at home for long periods, that is unless you don’t mind coming home to a house and it’s contents in turmoil, or the garden looking like a mine field. Most suited to a working home. If not on a farm working cattle, then one where it will be worked in other fields, such as obedience, agility, trailing, etc. Good with kids, but supervision a necessity while it’s a pup, as the working trait to nip at heels and bottoms when excited has to be controlled and curbed. The website looks great and nice and easy to get about! Particulary like the pic on health page. A job well done! March 12, 2011 at 10:49 pm. Permalink. Rusty, was the smarest dog I have hd the pleasure to own. If I hd fences, I would have another tomorrow. April 17, 2011 at 8:43 pm. Permalink. My partner and I are willing to get a dog in a few month. 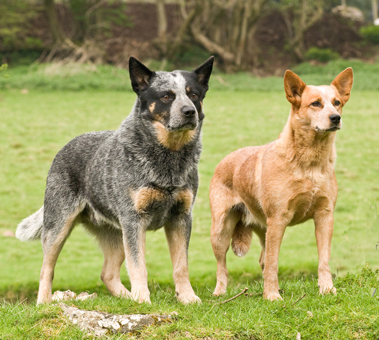 I grew up with a dog, and I have done a lot of researches on the breed that would best match our lifestyle and the Australian Cattle Dog came back very often as the most suitable one. However I want to make sure that if this seems like the dog that would suit us, we can be the owners that could suit the dog because the last thing I want is to realize after we get it that we can not make our dog happy. Reading facts about the breed is telling a lot, but I think meeting owners and dogs would also help us make sure we are making the right choices. We live in Wembley Park, North West London and I would like to know if there is anyone is this area, or slightly farther (we can travel), who would be happy to meet us, for a walk with the dog for example, so we can chat and learn from someone with a first hand experience. I hope this was the right place for this post, if you want to leave a reply I will be notified and we can exchange details. February 14, 2015 at 12:42 pm. Permalink. We have a blue heeler (rescue female) approx. 5 years old. We live in Kingston by Richmond Park and would be happy to meet for a chat and walk with Maya. We are currently looking for a breeder in the UK because we love the breed so much and would like to add to our family. February 22, 2015 at 9:57 am. Permalink. Hello, you are very happy! You already found a puppy, we also live in London but still looking where to buy this little miracle 🙂 We have two years old son, I hope they will like each other. March 26, 2015 at 8:25 pm. Permalink. February 25, 2018 at 9:27 pm. Permalink.